PinkyPiggu: Torikin 鶏金 Singapore ~ A Gem at Bukit Timah Road For Delicious Japanese Collagen Hotpot! 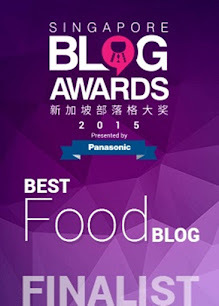 ♥ Experiencelism & Experimentalism ♥ A Singapore food blog on dining experiences and cooking experiments by a gal who loves all things pink and can't stop eating! 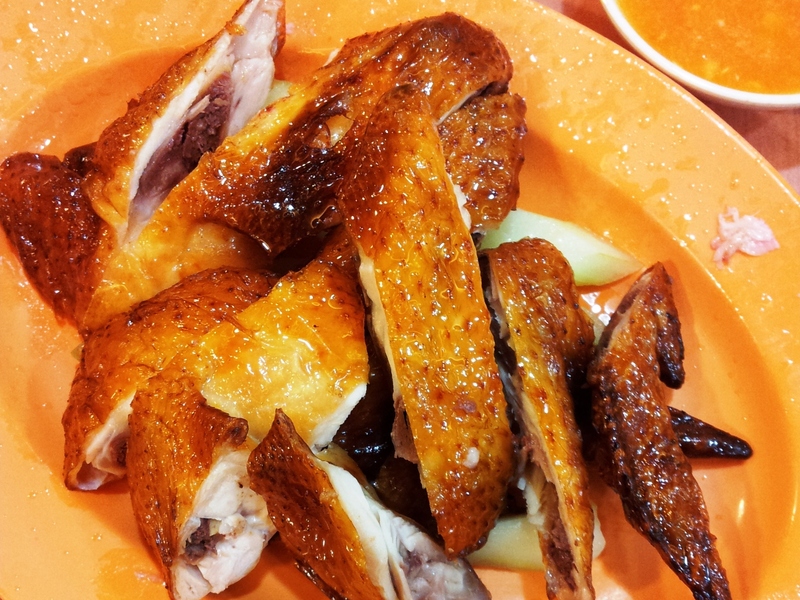 Torikin 鶏金 Singapore ~ A Gem at Bukit Timah Road For Delicious Japanese Collagen Hotpot! We can never get enough of hotpot, especially when it's collagen hotpot! Another restaurant to offer this beauty enhancing deliciousness is Torikin 鶏金, a Mizutaki ~ Japanese chicken and collagen hotpot ~ specialist that has its origins in Hakata, Japan. I was told that the boss himself is from Japan, and Torikin is his very first Singapore venture. Must thank him and his team for bringing us such a wonderful dining experience. ありがとう!!! Haha we had actually "gatecrashed" the dinner service without making any reservation, and was glad that they are still able to accommodate us at the last available table! Though the restaurant area is pretty small, it is cleverly divided into several sections: alfresco, sushi counter, booth tables and also a semi-private room with horigotatsu, those traditional Japanese-style seating where the dining table is placed over a sunken platform. The use of mainly clean-lined wood elements accented with Kanji (Chinese characters) calligraphy on the walls gave the intimate space a sense of peace and homeyness. I like. Since its opening in October last year, Torikin's pool of regulars has been steadily growing, many of which are Japanese. In fact, most diners on my evening of visit were Japanese, which is like a nod of acceptance to the Japanese cuisine served here. Besides the signature collagen hotpot, on the menu are Sashimi ($17.90 to $59.80 per platter), interesting starters such as Salted Squid with Cheese ($7) and Chicken Skin with Ponzu ($5), and also donburi choices including Oyako Don ($15.80) and Salmon & Salmon Roe Rice Bowl ($15.80) which makes great one-dish meal. From the Toubannyaki (food cooked and served on earthenware) selection, I thought Avocado Okonomiyaki ($16.80) sounds rather exotic, so we kept to the familiar favorite, Hakata Tonpei Yaki ($17.80). The rendition here was the best I had so far, a piping hot medley of soft cabbages and tender pork belly slices beneath a blanket of fluffy omelette topped with savory sweet okonomi sauce and mayonnaise. Very nice! Very delightful! This is a must-order! As Torikin is foremost a chicken-centric place, there are also quite a number of chicken items such as Oita Chicken Tempura ($12) featuring crisp tempura batter enveloping tender moist fillet meat, as well as Grilled Chicken Wing ($10.80). I thought my tolerance for spiciness is considered high, but these chilli-pepper coated chicken wings had me waving the white flag tissue in embarrassing defeat. Finally, the star of our meal arrived, a whole pot of Hakata Mizutaki! Available in 3 serving sizes (S-2pax $70 / M-3pax $100 / L-4pax $135), each set of collagen hotpot comes completed with chicken pieces, minced chicken and assorted vegetables. The chicken stock is boiled over 6 hours daily using Sakura chicken which is free of antibiotics and growth hormones. 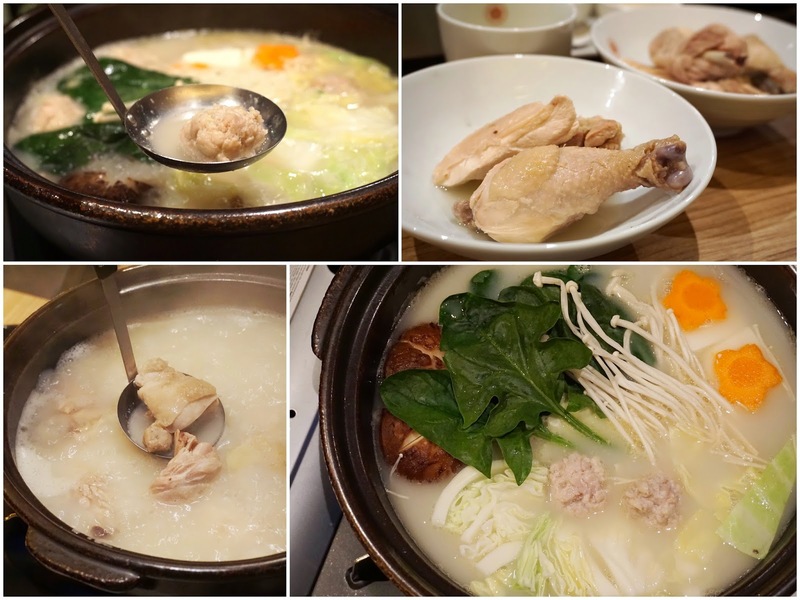 Collagen from the chicken is already well-infused into the slightly sticky, milky-white broth by the time it reached our table, pampering us with its rich flavors, yet gentle enough without the surfeit afterfeel. If you are not already in the know, collagen is an essential protein to hold our skin together, giving us that coveted firmness and elasticity. I super like! Give me more! Lol! First thing first, taste the broth! We used the small cups provided for each satisfying sip. Eat the cooked chicken pieces with their homemade ponzu sauce. Next, enjoy the minced chicken balls which the staff will assist to cook as we're eating the chicken pieces. Vegetables, mushrooms and tofu are then added into the soup for further sweetness. Lastly, rice and egg are added into the soup to make porridge. Though the ingredients might not seemed like a lot, it added up adequately to a fairly substantial meal. But it also could be the fact that we already had a few ala-carte items before commencing on the hotpot set. We wondered about the comparative higher price to other places offering collagen hotpot as well, and questioned our wallet if it's worth it. To think that green tea is charged at $3 for a small cup and not refillable (a practice which differs from the typical Japanese restaurants), irked me a little too. In the end, tummy replied okay lah since the food was yummy, and brain said yes because service was excellent! The service at Torikin certainly left a deep impression on me. For instance, the waitress actually knelt by our tableside and spent a few minutes patiently explaining the menu to us, and she knelt down each time I asked her a question that I felt so paiseh about it. Every time a dish came, she will neatly re-arranged the existing plates on the table, before setting the new one down. You might say it's typical of Japanese culture, but I say, what we experienced is not the usual standard of service in Singapore, especially in a casual dining establishment such as this. Overall, I love the food, I love the service, I love this place which has none of that commercialized restaurant feel. Torikin is a great place if you're looking to have a good meal away from the city. A gem in most senses, go before it gets too crowded and difficult to get a reservation. いただきます! I wonder how is this compared to Bijin Nabe? 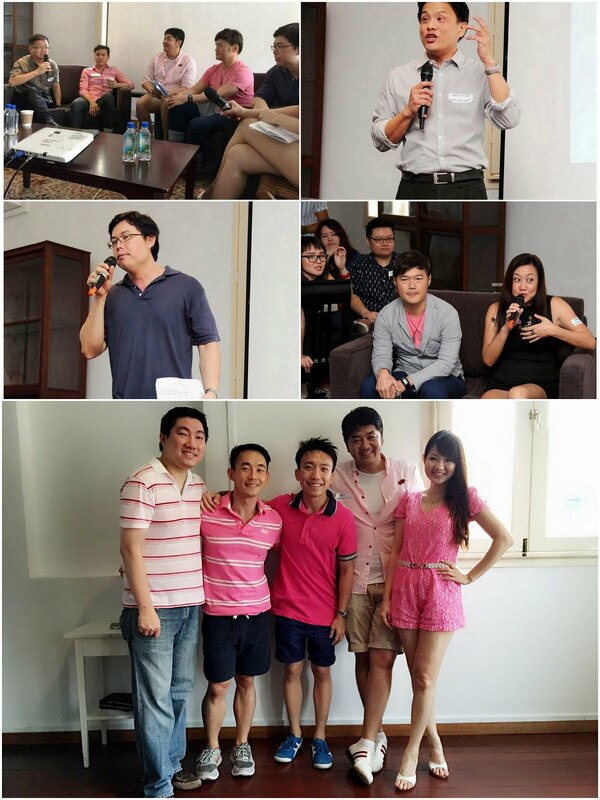 PinkyPiggu on Toggle Foodie Makeover 美食大翻新 ~ Watch It Here! The challenge is to give a popular local delight a makeover, adding a creative twist to it. The end product has to look good, taste good, and be appealing to diners too. You can catch the amazing Bak Kwa makeover on Foodie Makeover 美食大翻新! HolyCrab @ Tan Quee Lan Street ~ Be Ready To Get Orgasmic Crab And Hooked On Hokkein Mee! 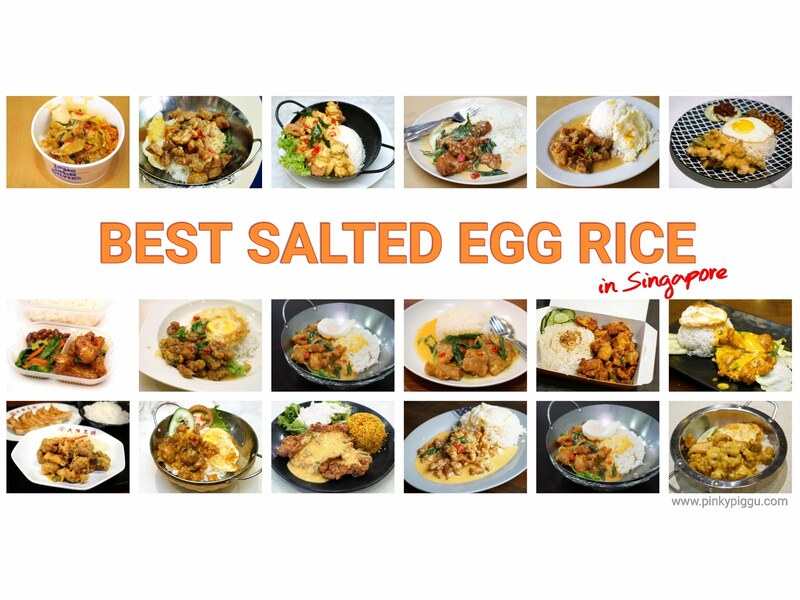 BEST Salted Egg Rice In Singapore! Chicken, Pork, & Halal Options Included! Da Luca Italian Restaurant @ Goldhill Plaza, Novena ~ One Of My Best Meals Of The Year! Highly Recommended! Penang Road Famous Teochew Chendul @ Lebuh Keng Kwee, Georgetown ~ CHENDOL! ASSAM LAKSA! ROJAK! What's Your Favorite? New Ubin Seafood's New Outlet At Zhongshan Park. Still One Of The Best "Tze Char" Places In Singapore. Daebak Ghost Pepper Spicy Chicken Noodles! The Spiciest Instant Noodles Ever From Malaysia! Yan Ji Wei Wei Seafood Soup 炎记威威食品 @ Woodlands Centre Road Food Centre ~ Could This Be The BEST Seafood Soup In Singapore? Beauty In The Pot 美滋锅 @ OneKM ~ Hotpot Restaurant With Pink Princess Theme! 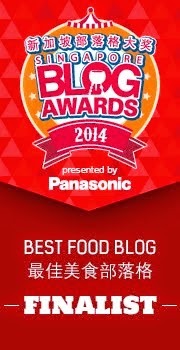 Search This Blog For Delicious Food! 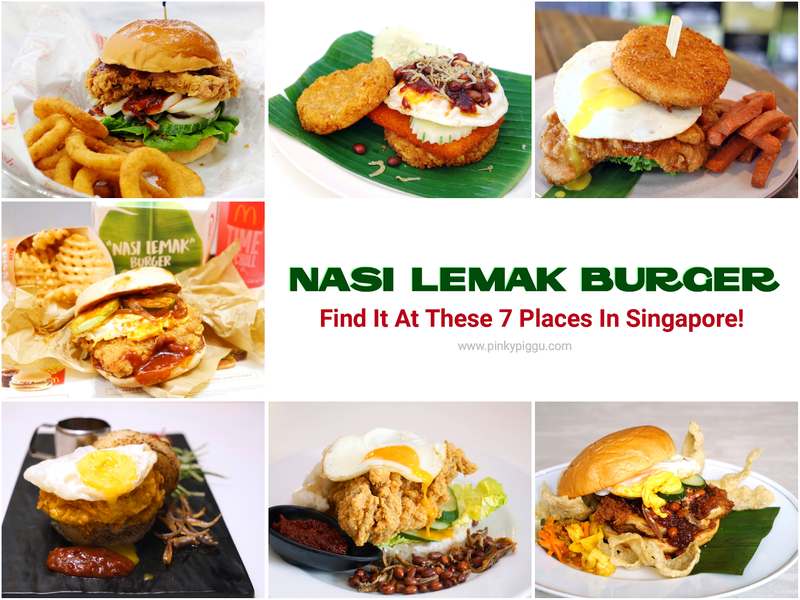 NASI LEMAK BURGER! Find It At These 7 Places In Singapore! 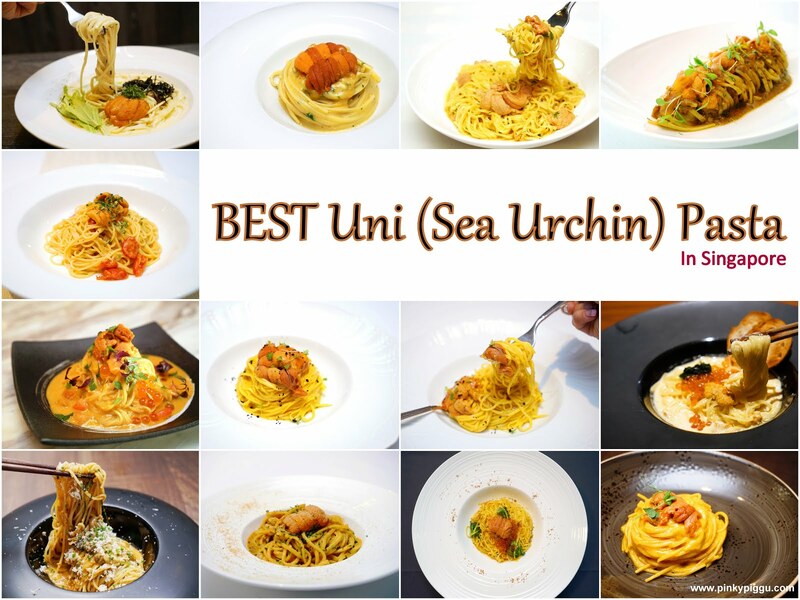 BEST Uni (Sea Urchin) Pasta In Singapore! HONEY BUTTER CHICKEN! 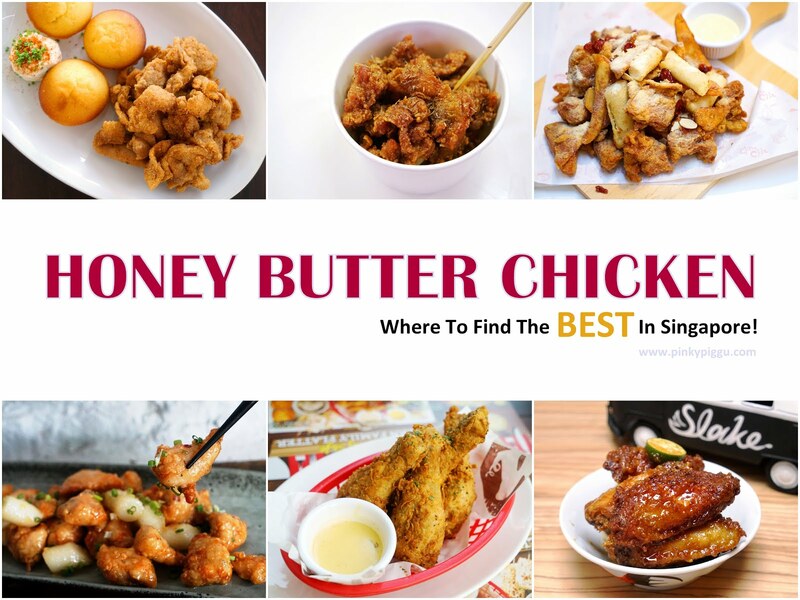 Where To Find The BEST In Singapore! 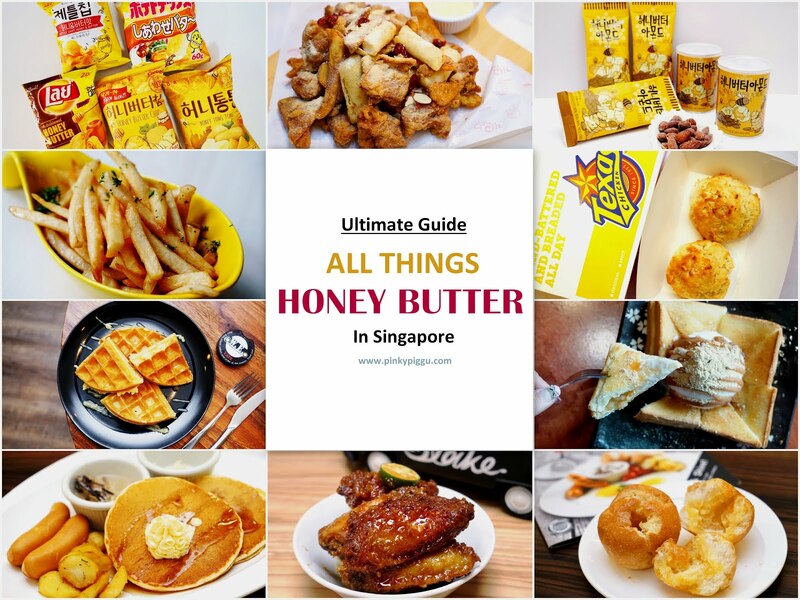 Ultimate Guide To All Things HONEY BUTTER In Singapore! 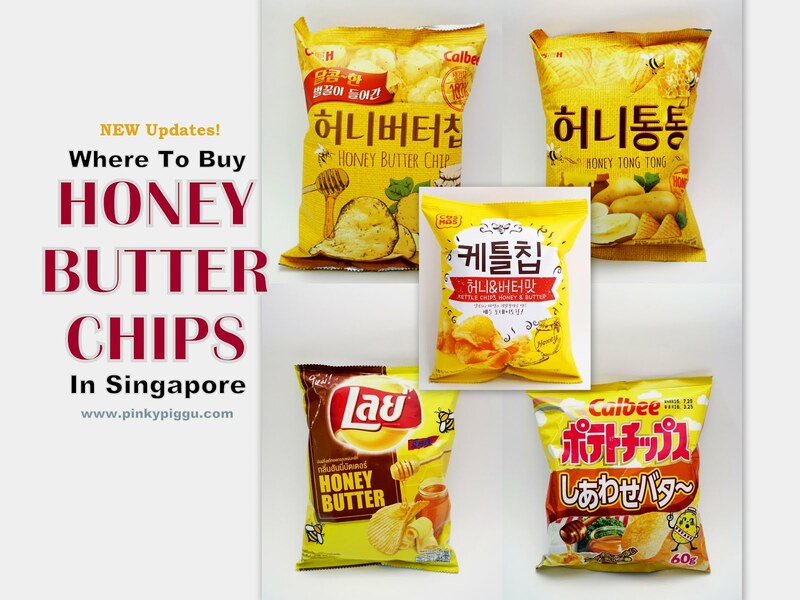 HONEY BUTTER CHIPS! Where To Buy The Popular Snacks In Singapore? Find Out Here! BEST ANGEL HAIR PASTA! 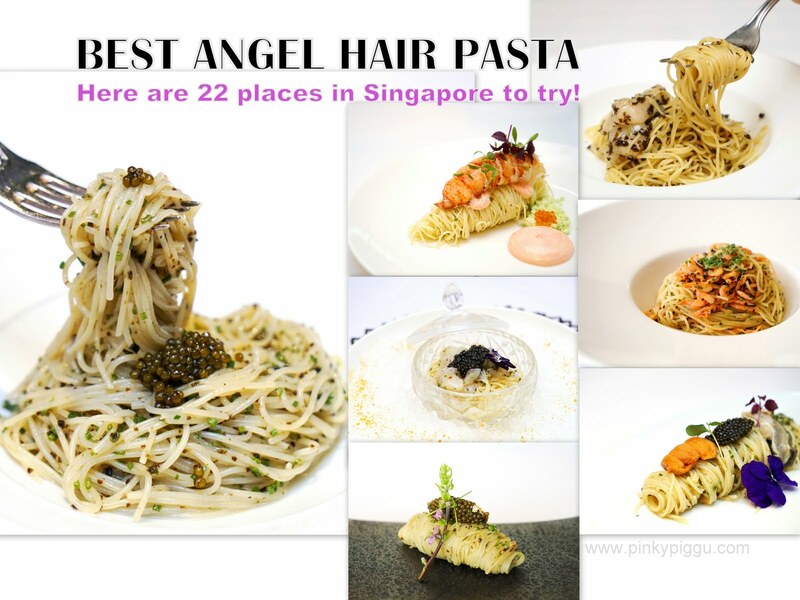 Here are 22 places in Singapore to try! 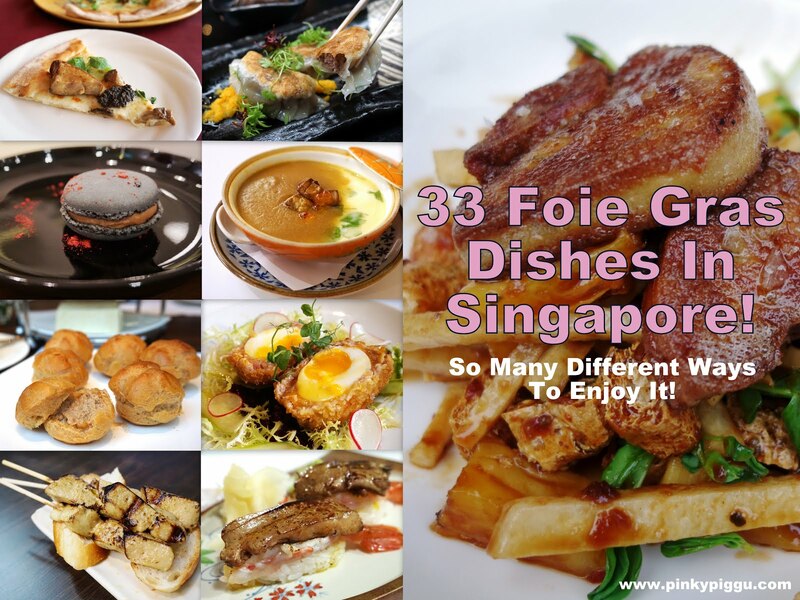 33 Different FOIE GRAS Dishes in Singapore! 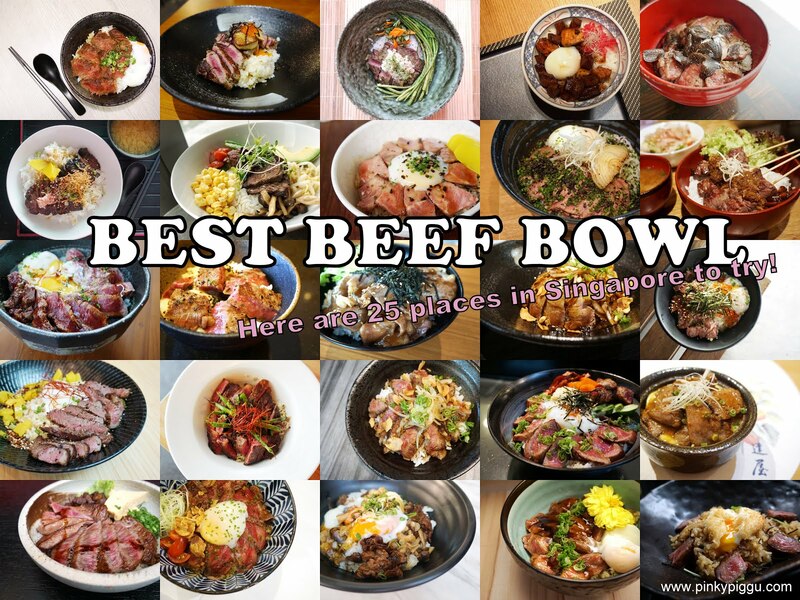 BEST BEEF BOWL! 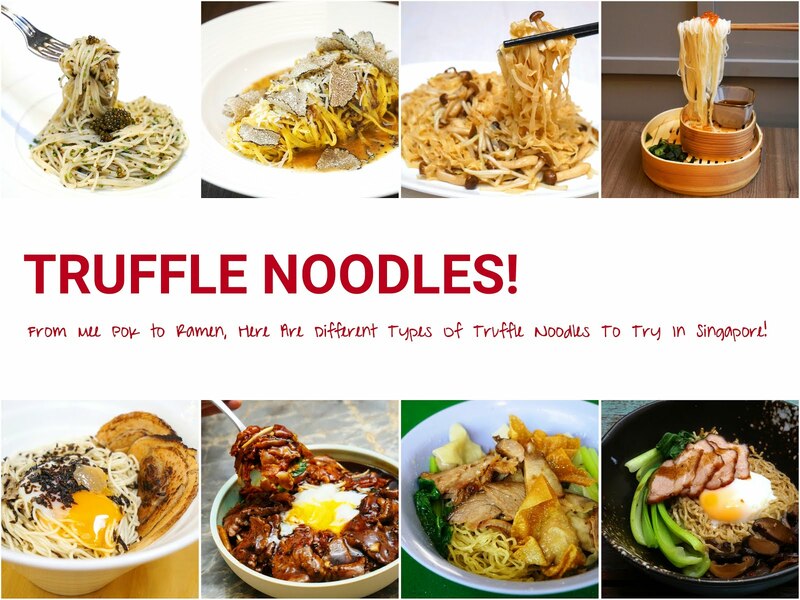 Here are 25 places in Singapore to try! 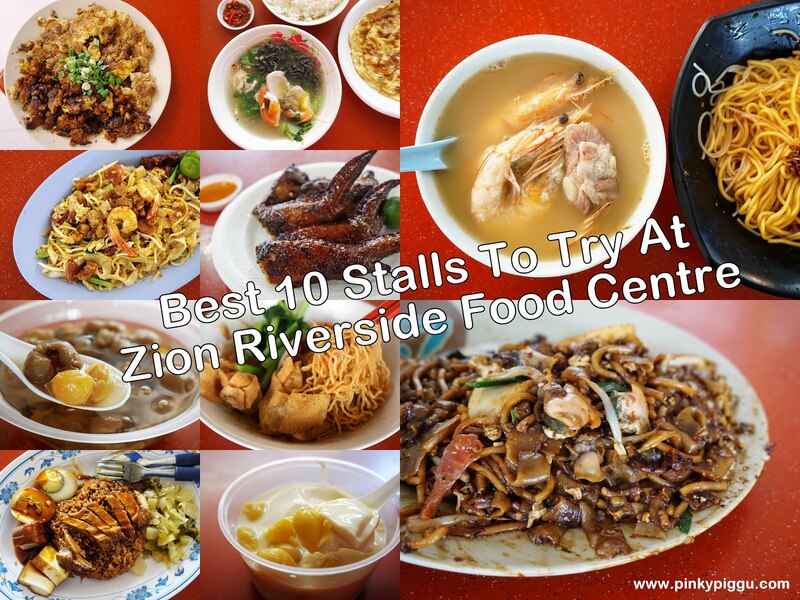 Best 10 Stalls To Try At Zion Riverside Food Centre! 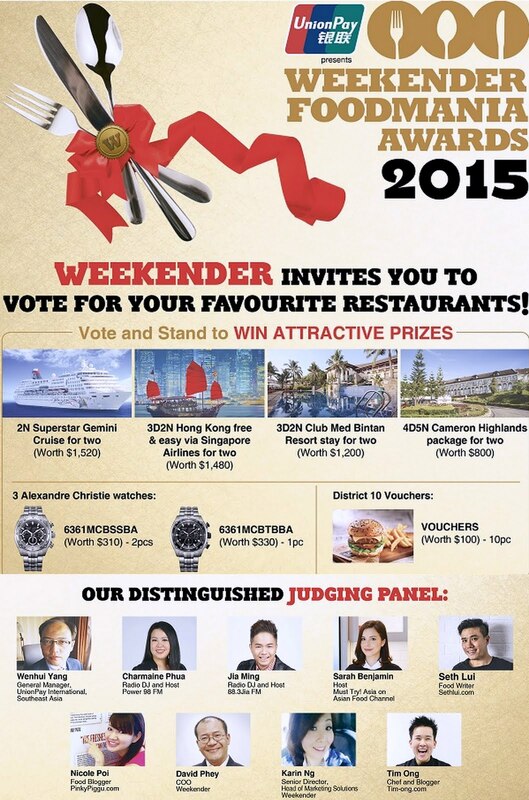 Weekender Foodmania Awards 2015 ~ Vote & Win!